Cliftonville lifted the pre-season Charity Shield by beating Ballymena United 4-2 on penalties. The Solitude shoot-out was needed when the match ended 0-0 after 90 minutes. In normal time, Ballymena's Neal Gawley hit the angle of bar and post with a fine free-kick while Joe Gormley's late shot struck an upright. George McMullan, James Knowles, Johnny Flynn and Marc Smyth scored penalties for Cliftonville with Matt Tipton and Michael Ruddy on target for United. 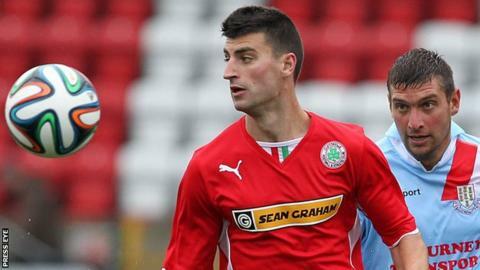 Gormley, top scorer for Cliftonville in their title-winning campaign, saw his spot-kick saved by Ballymena keeper Dwayne Nelson. But Reds goalkeeper Conor Devlin then saved successive penalties by David Cushley and Tony Kane to turn the shoot-out the way of the Premiership champions.